It’s been a weird month for DJI. The Chinese drone giant had planned a big press event on July 19 but postponed it at the last minute. Now, several leaked images showing three new DJI drone models are floating around the internet. They all appear to be part of the Mavic family, and damn, do they look cool. The DJI page explains that the new Mavic 2 Pro would come with a one-inch Hasselblad CMOS sensor, which is fairly huge for a drone of this size. (The sensor is likely made by Sony.) Meanwhile, the Mavic 2 Zoom comes with a 2X optical zoom (24mm to 48mm), which is a completely new feature for a DJI drone. The copy also says the drones will fly up to 45 miles per hour and offer a 31-minute flight time, a five-mile range, as well as “omnidirectional obstacle avoidance.” There was no pricing information listed. DJI did, however, confirm the existence of the images. But wait, there’s more. 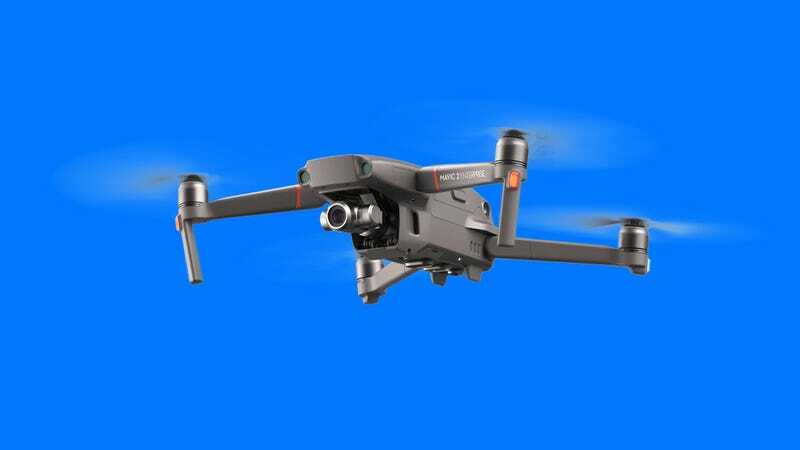 A separate leak popped up on DJI’s German website and showed an image of a drone labeled as the Mavic 2 Enterprise edition. This aircraft looks a lot like the image of the Mavic 2 Pro, except it’s potentially a bit beefier. It’s hard to say since we only see the new Mavic 2 drones folded up in the Argos catalog, but other leaked images of the Mavic 2 Enterprise edition from earlier in July suggest that this model is equipped to handle heavier payloads for commercial flights. A pair of images shows new, DJI-branded attachments that go on top of the Mavic 2 Enterprise edition. One of the payloads appears to be a speaker or a sensor, while the other one looks like it might be an LED beacon. What does it all mean? It’s unclear. Many people have expected that DJI would update the Mavic Pro this year, especially since the Mavic Air made its debut six months ago and the Mavic Pro is now two years old. The idea that DJI would release an enterprise drone with the highly portable form factor of a Mavic drone also seems very sensible. After all, DJI has increasingly pushed its enterprise division in recent months. Until the official announcement, however, we don’t really know what the new Mavic 2 Enterprise edition can do or how much it will cost. The same goes for the other two Mavic sequel drones. DJI says it hasn’t yet picked a new date for its big press event. When it postponed the previously planned event earlier this month, DJI said it did so because the company “wanted to ensure we can exceed our customers’ expectations for our technology by the time of the event”—which sounds like a way of saying that its drones didn’t work right by the time the event came along. DJI says it will be rescheduling the event soon, though. In the meantime, lots of people are complaining online because they’ve seen the new DJI drones, and they look cool, but they can’t buy one yet. I’m inclined to agree with this sentiment. I would very much like to fly these cool, new shark-looking drones! But I can’t right now. Leaks are cool because you get a sneak peek at stuff before it’s available. They’re also kind of unfair because you can’t do anything about it.